The A5 Indesign User Manual Template is an Adobe InDesign Template with which you can create your own instruction manual for your toy or electronic equipment. You can use the template to create a well-designed manual by adding your own logo or changing the font yourself. Do you trade/sell toys or electronic equipment? Do you want to provide a well-designed user manual with the product? We have developed this InDesign User Manual Template for everyone selling toys or electronic equipment. Use our Indesign User Manual Template to create well-designed instruction manuals for your own product. The template is most suitable for small electronics and toys, because of its layout (manuals for machinery are more widely set up). 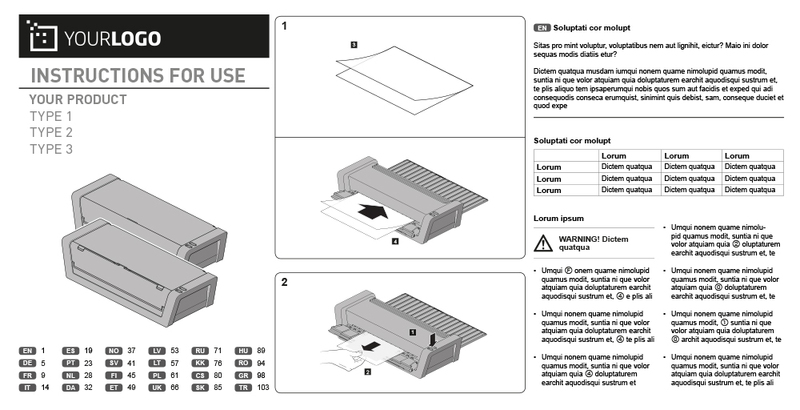 The template has 6 pages in total and is specifically designed for multi-lingual instructions. It is not a template that legally complies. Therefore, have a look at our User Manual Templates in Word.